Need that little extra push of help to understand the records? For $5/month you can subscribe to my weekly newsletter, where every weekend you will receive an email newsletter with a translation of one each of birth, marriage and death records. This will help you get familiar with different spellings, vocabulary words and record formats. Right now the dominant religion for the records I include is Lutheran, but I feature other religions every so often as well. If you have a particular interest that isn’t Lutheran, let me know and I’ll be sure to feature that one regularly as well! Just like Steps to Latvian Genealogy Success, this newsletter comes out on Monday. Struggling with all of the vocabulary necessary to conduct Latvian genealogy research? Why not use a game to help you remember it? These sets of playing cards can help you. You can use them just like any other deck of regular playing cards – the cards are numbered 1 through 13, there are two “jokers” (wild cards), but instead of four suits, you have terms in four languages – English, Latvian, German and Russian. Just what you need to get practice with the languages! There will be a variety of playing card packs available as time goes on, but right now, there is this one to start with. It covers Family Relationships – parents, children, in-laws and so on! Right now, you can purchase the cards as digital downloads for $4.99 – which means that once your payment is confirmed, you will be emailed the file to your selected email address. You will then be responsible for printing the cards yourself, either at home or at a print shop on cardstock paper. 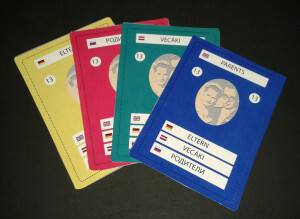 Example view of the four “Parents” cards.